Lantana, a shrub popular in Southern gardens, grows throughout the United States and performs as an annual or perennial, depending on location. In USDA hardiness zones 9 through 11, the shrub thrives year round. In cooler zones, lantana grows as an annual and dies back with the first frost of winter, though some gardeners overwinter the plant indoors. Valued for its colorful flowers, reliable blooming, ease of care and attractiveness to butterflies and hummingbirds, lantana makes a dramatic statement in any home garden. 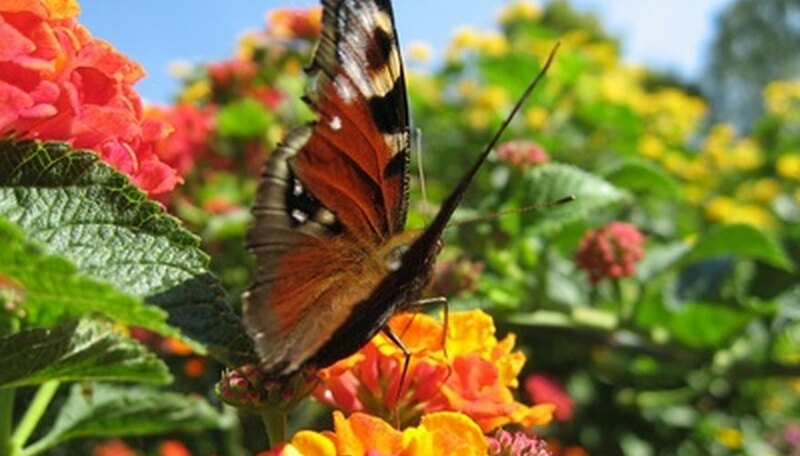 Lantana requires full sun and warm temperatures to thrive. Well-drained, slightly acidic garden soil of average fertility provides the best growing medium. Heavy, clay soils with poor drainage may stunt the plant's growth or cause rotting. Tolerant to salt, lantana makes an excellent choice for planting near oceans. The shrub grows rapidly during hot weather but dies quickly when frost arrives. Plant in spring after all danger of frost has passed in your area. Lantana needs at least 6 feet of space between plantings, as it quickly covers a large area. Gardeners in cooler zones may grow lantana in containers for easy overwintering indoors. Newly planted lantana shrubs require frequent watering to keep the soil consistently moist, usually about twice per week for the first two weeks of growth. This gives the plant's roots a chance to spread into the surrounding soil. Established plants require little supplemental watering, except during times of drought. For the best results, apply water to plants grown in the ground once per week only during weeks that do not receive at least 1 inch of rainfall. Container-grown lantana plants need water only when the top half inch of soil is dry to the touch, which may be daily during extremely hot weather. Apply water directly to the soil instead of from overhead, as frequently wet foliage may increase vulnerability to disease. Feeding lantana with a balanced 20-20-20 NPK fertilizer just after planting in spring gives the plant a jump start on new growth. An annual application of fertilizer in spring provides all the nutrients the plant needs to thrive and flower. Container-grown lantana plants, however, benefit from monthly applications during the spring and summer. If desired, feed vigorously growing plants a second time in mid-summer, as long as they have enough water. Over-fertilization or feeding while plants are water-stressed may decrease flower production. Few other shrubs require so little care and bloom so prolifically. While dead-heading promotes maximum blooming, gardeners who do not remove spent flowers still have plenty of blossoms throughout the growing season. Lantana shrubs benefit from the occasional pruning of tip growth during the summer months to promote flowering. Plants tolerate pruning of up to one-third of their total height and spread if they become too large for their growing space. Perennial lantana plants require a hard pruning to within 6 to 12 inches of the ground in spring to remove old, woody growth. In hardiness zones 9 through 11, lantana requires no special winter care and typically survives all year. In zones 7 and 8, plants may survive the winter if provided with a thick layer of shredded bark mulch. Although they will likely sustain frost damage in these zones, they bounce back with a hard pruning in spring to remove damaged limbs. In zones 6 and above, lantana grows as an annual and dies back completely if left in the ground through the winter months. Gardeners in these areas may grow the plant in a container or dig it up and pot it before the first frost, and then overwinter it indoors. Placed in a warm room near a sunny window, lantana will live but may not produce flowers until placed back outdoors in spring.